I met with the SFMTA a number of times that year, trying to get them to realize that it doesn't take much effort to come up with something better, and that San Francisco is full of designers and developers who would be glad to donate their time to the project. 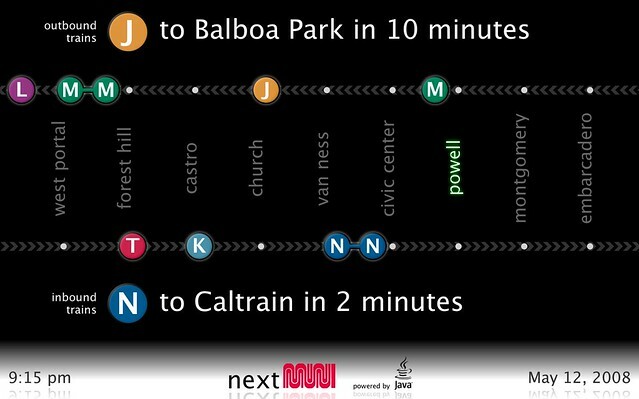 My designs made their way around SFMTA, and everyone seemed to like them, but in the end it turned out that they had already paid some contractors to design a new status screen that was eventually used in most stations in 2009. The new design, while an improvement over what we had before, has lots of problems and is not as usable as it could be. I regret that I didn't try harder (or get involved sooner), but the SFMTA is a frustrating bureaucracy and it was apparent that I couldn't stop a snowball in motion. The Prism engine was designed to provide high-performance 2D/3D graphics while also serving as the "heartbeat" for smooth animations in JavaFX. One cool thing about Prism is that it takes advantage of JSL, the shading language from the Decora project. Many graphics primitives in Prism were written in JSL and take advantage of the GPU whenever possible. The source code for Prism is available under the OpenJDK project in the OpenJFX repositories. Look under the modules/graphics/src/main tree for the core Prism runtime sources as well as various platform-specific backends. The project contains a custom compiler that I wrote (using ANTLR), which takes JSL programs and compiles them down into a number of variants, like a GLSL version for use with the OpenGL backend, an HLSL version for use with the Direct3D backend, and a couple different software-based implementations (Java, C/SSE) that can run on the CPU for cases where a GPU is not available. Although Decora was primarily designed as an implementation detail of the overall JavaFX runtime, it was also designed to be toolkit agnostic, meaning that it could be used as a standalone library, complementing Java2D and other graphics engines. The source code for Decora is available under the OpenJDK project in the OpenJFX repositories. Look under the modules/graphics/src/main tree for the bulk of the Decora runtime. The Decora/JSL compiler sources can be found under the buildSrc/src/main tree in the com.sun.scenario.effect.compiler package. Content is © Chris Campbell. All rights reserved.